Because of this wall I had zero hours of sleep yesterday. After becoming obsessed with a part of a 600 year old Dutch play named "Everyman," my will to finally wall a theme about blood, weird abstract stuff and Deathnote finally became realized. Too bad it had to take place mostly between 12-6 AM on a school day... After I came home I finished the minor touches on the wall. Have mercy on me in this most need! Of mine acquaintance that way me to lead?" Added with Fallout Boys Dance Dance line going "Misery loved me" Spinning in my head and the saying how "Misery Loves Company" added with a Deathnote theme and BAM... My reason for failing this semester again... -_- The background was made out of mostly blending a single png over itself again and again. Omg...there's blood everywhere! Yeah, I think you're mad...no sleep...But that's not the point. The point is, it's a good wall. Some people obssesed with reddish things like blood. And I think they have the taste for this. The bg looks great. Stunning great. The scan looks great too. anyway i like the the scan u use ! 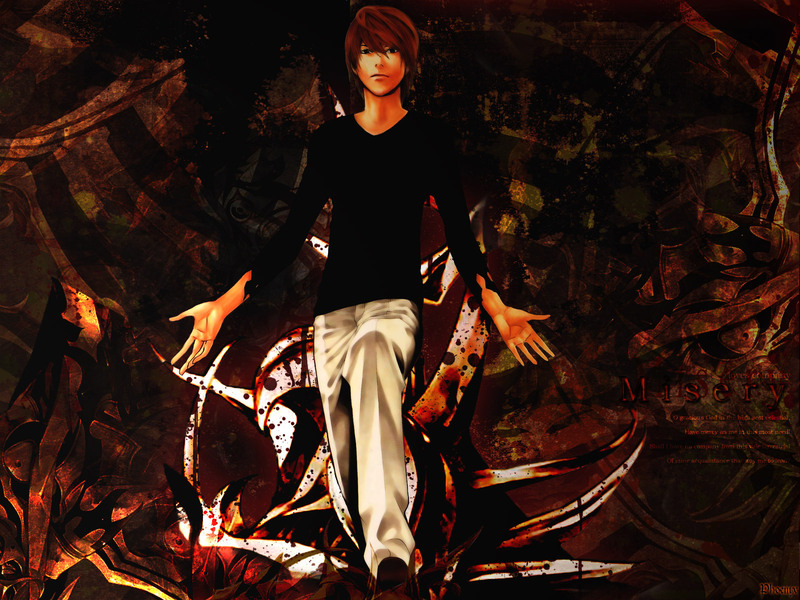 awesome wall, death note is the best. great blood effects. awesome wallpaper. oh my gosh ... I just discovered that there's death note wallies here so I ran to the gallery for it. *speechless* ^_^ thanks so much for sharing. Keep up the good work! I really like the color scheme you used! Suits the picture and the character magnificently! Edit: And then I lookeed at it bigger-ized, and the detail totally floors me! Great work! Whoa scary... But that's how a deathnote wallpaper should be! Great job at making the mood of the picture! Nice scan you're using and the background is just awesome... Thanks for sharing! Wow! Nice background. I love it. It is well-done wall paper fantastically. Daark :D I like it. THX a lot! great wall! the background is great and the wall is very clean. thanks! Amazing wallpaper! Thanks for making a wallpaper for just Light^^, Ive been dying to find a really hot one of him. <3 all your sweet layers, wish mine came out that cool! I love the bloodspatter and gory style of the background. It really gives the image a distinctive feel! I like the dark veil and blood effects in this piece, good job!